HVAC Brain, Inc. Now Carries The Complete Line Of Amtrol Tank Products. HVAC Brain, Inc. is the complete resource for Amtrol tanks and replacement tank products. With competitive pricing and quick shipping, facility managers and HVAC professionals benefit from HVAC Brain’s wide selection of Amtrol products. HVAC Brain, Inc. (www.hvacbrain.com), retailer of HVAC/R equipment and replacement parts, announces the addition of Amtrol products to their extensive online product offering. In addition to Amtrol’s popular expansion tanks, HVAC Brain also carries full range of Amtrol tank products and replacement parts. 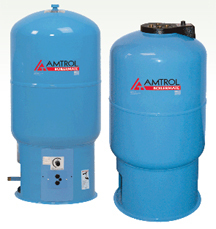 Amtrol is a reputable manufacturer of water system solutions. HVAC Brain carries well-known Amtrol products including the Boilermate, Well-X-Trol, and Therm-X-Trol lines. Quality Amtrol products include expansion tanks, pressure tanks, well tanks, hot water storage tanks, bladder tanks, diaphragm tanks, air purgers, and pressure boosters. All of Amtrol’s tank products are backed by warranties spanning one to ten years. Amtrol products provide reliable solutions for facility managers and HVAC professionals, and are a smart choice for both residential and commercial applications. HVAC Brain offers competitive pricing on Amtrol products, as well as quick shipping for convenience. HVAC Brain’s technical staff is available by phone or email to answer any questions regarding the Amtrol line of products. HVAC Brain, Inc. is a fast growing retailer of HVAC/R equipment and replacement parts. At HVACbrain.com, HVAC professionals and maintenance managers can find wide variety of ‘hand-picked’ high quality HVAC products such as Solar Water Heaters, Heat Pump Hose Kits, Energy Recovery Ventilators, and HVAC coils. With HVAC Brain’s tight vendor relationships, customers can choose and order products without worrying about the quality of products HVAC Brain offers. Contact Info: HVAC Brain, Inc. 9545 Midwest Avenue, Unit A - Cleveland, Ohio 44125, 216-663-4822, info@hvacbrain.com.